This product is handmade by pure natural sandalwood, antistatic and comb smooth. Material: Sandalwood. Comb exquisite beauty, ideal for personal use or giving gift to friends and relatives. Item Type: Comb. Massage scalp, balance oil and accelerate blood circulation. Why not have a look?. 19 wide comb teeth, prevent you from hair tangling. Do you want to have a simple but practical comb?. Type: Comb. Made by high-grade ABS, durable and comfortable to use. 2 Pcs Hairstyle DIY Wide Tooth Plastic Curly Hair Care Handgrip Comb 9". Easy to use, keep your hair neat and trim in just a few minutes. Features lightweight and portable design. The Hair Comb is made of plastic material, is suitable for both girls and ladies. Wonderful accessorize for family use. Perfect for freshen up, make up, hairdressing, etc. Convenient to carry in your handbag, is suitable for different hair style. Reinforced comb teeth make them less likely to fall off and loosen for durability. The comb teeth are composed of steel needles with a smooth texture and a smooth hand. Item Type: Hair Comb. 1 x Hair Comb. 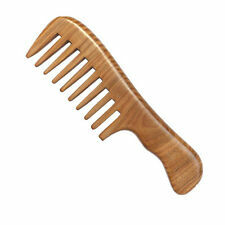 Natural Sandalwood Wide Tooth Comb. 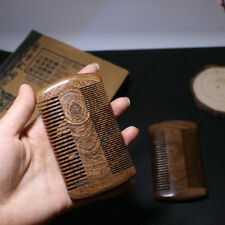 This product is handmade by pure natural sandalwood, anti static and comb smooth. 1 x Sandalwood Wood Comb. A healthy tool for hair care. Cleansing skin scalp, unplugs and treats follicles and hairs. 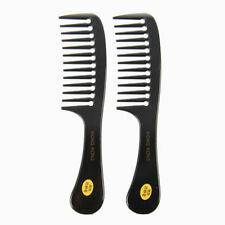 2 x Professional Large Hair Shower Combs (Set of 2 Combs). A large pronged rake comb for combing through the hair in preparation for styling. Professional Stylists Large Hair Shower Comb Set. Perfect for applying conditioner and shampoo. 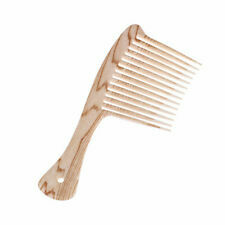 Anti Static, Amoora Wood, wide toothed comb; ideal for styling and Streaking a Pompadour Hair style. Also great for larger, coarse Beards. Pompadour Hair Style or Beard Comb. Pocket Sized at approx. This product by natural wood, antistatic and comb smooth. Comb exquisite beauty, ideal for personal use or giving gift to friends and relatives. Item Type: Comb. Cleansing skin scalp, unplugs and treats follicles and hairs. Soft Double Knitting Chunky Towelling Wool Ball Skeins Yarn new -C. Winter Children Girl Kids Baby Warm Wool Hats Beret Artist Beanie Hat Ski Cap 8C. Cozy Soft Strawberry Pet Dog Cat Bed House Kennel Doggy Cushion Basket Beds 8C. Dimples Jumbo (H640) Wide Tooth Comb Black Colour width: 9.5cm total length:21.5cm comb head length: 10.5cm. Size app:Handle 6.5x3cm, Tooth 6.5x6.5cm. Due to the light and screen difference, the item's color may be slightly different from the pictures. We will reply you ASAP. Your kind understanding and patience will be highly appreciated. Soft Knit Chunky Towelling Baby Wool Ball Skeins Yarn Coral Velvet Scarf - CB. Hand Rest Cushion Pillow Nail Art Design Manicure Care Salon Accessories NEW- CB. 5mm 1000pcs HAMA/PERLER BEADS for Child Gift GREAT Kids Great Fun HOT - CB. Description: 100% New and high quality. This product is handmade by pure natural sandalwood, antistatic and comb smooth. Not to hurt the scalp, smooth texture. Topical massage remedy for headaches maintains circulation depositing of rare nutrients protein and minerals by rubbing. Cleansing skin scalp, unplugs and treats follicles and hairs. Helps prevent and improve thin areas and remedies hair loss, adds shine. Comb exquisite beauty, ideal for personal use or giving gift to friends and relatives. 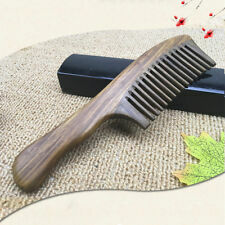 Natural Golden sandalwood combs hairbrush Wooden Comb. Wide Tooth No-static Massager beard comb for hair massage peine. Item: Comb. Comb size: 15 5.3cm. Function: Massage, anti-hair loose, no static. Teeth: Wide teeth for any hair type. Silicone Sippy Cup Lids - Spill Proof Trainer Learner Bottle Glass Sip Toddler. All In One Bottle Opener Jar Can Kitchen Manual Opener Gadget Multifunction LH. Black Comfort Wrist Gel Rest Support Mat Mouse Mice Pad Computer PC Laptop Soft. Made of natural green sandalwood, which is olive in color and hard in wood. Material: Green Sandalwood,Buffalo Horn. Comb teeth with high quality blackbuffalo horn, bright black color, warm feeling. Main Color: As the picture shows. Item No. : 796912. Luxury DOUBLE Wide Tooth Professional Detangling Hair Comb. Wide double tooth with rounded edges. Perfect for long / thick hair / curly hair. Prong length: 3 cm. Amber Colour. Colour : Amber. Type : Brushes & Combs. Dimples Large double dipping (H652) De-Tangler Black Colour width:4.6cm total length:21.5cm. A large long pronged rake Handle comb. for combing through the hair in preparation for styling. It's ideal for combing conditioner through the hair after shampooing. 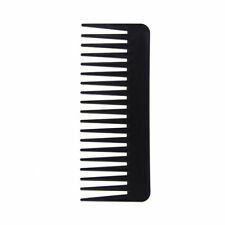 A High quality professional hairdressing comb. 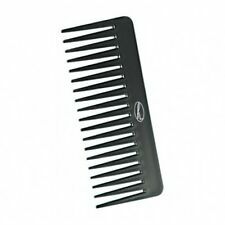 Black long wide toothed comb. Material: Sandalwood. Specifications: long 18CM, wide 5.4CM, thick 1CM, tooth width 4MM. You can follow below process to chontact us. Note: due to pictures and computer monitors, there may be a slight chromatic aberration between objects and pictures. Usage: Hair Comb,Mustache and Beard Comb. Hair Type: Curly Hair, Straight Hair, Beard,Long Hair, Artificial Hair. 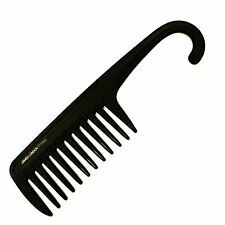 Tooth of Comb: Wide Toothed Comb. Size: Peach Wood Close tine comb :18cm 4.5cm 1.1cm(Variation 0.2-2cm). Wide large tooth design prevent your hair tangling. Due to the light and screen difference, the item's color may be slightly different from the pictures. Economic saving and easy to clean. Anyway we will try our best to avoid this kind of thing. Professional High Quality Wide & Long Teeth Comb. Ref # 105-00. Each Mason Pearson comb is handcrafted using traditional techniques. Mason Pearson Combs. Put it to work and the polished teeth glide easily through your hair as your scalp is treated gently by the smoothly rounded ends of each tooth. QualityDuralon Professional Hairdressing Tortoise Shell Effect Hair Afro Comb. 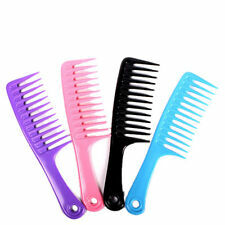 Very strong and flexible durable comb. Hollow handle so it can be hung up. Prong length - 2.8" 7cm. Designed to help you achieve professional results. 1 Pce Comb. The color may be slight different due to the condition or light or different monitor. The images are for reference only.